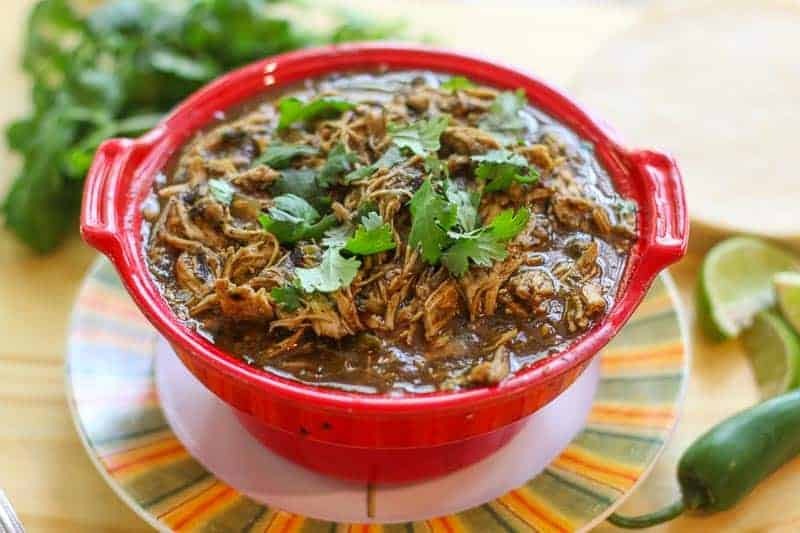 15 Minute Instant Pot Salsa Verde Chicken is easy to make, full of delicious spicy flavor, and healthy! It is great as an entree or on tacos, burritos, enchiladas, and over rice. It is paleo friendly, low carb, and gluten free. You will love this tasty dish. I am loving my Instant Pot if you can’t tell…. I have been doing a bit of meal prep during the week. I have been making a bunch of meals for my husband to take to work every day. I also have some meals I keep in the freezer to grab for the days I don’t have time to cook. That has kept us from going out to unplanned dinner. We are trying to eat healthy. I want to save my days out to eat at really good restaurants instead of going somewhere mediocre because I didn’t have time to cook. 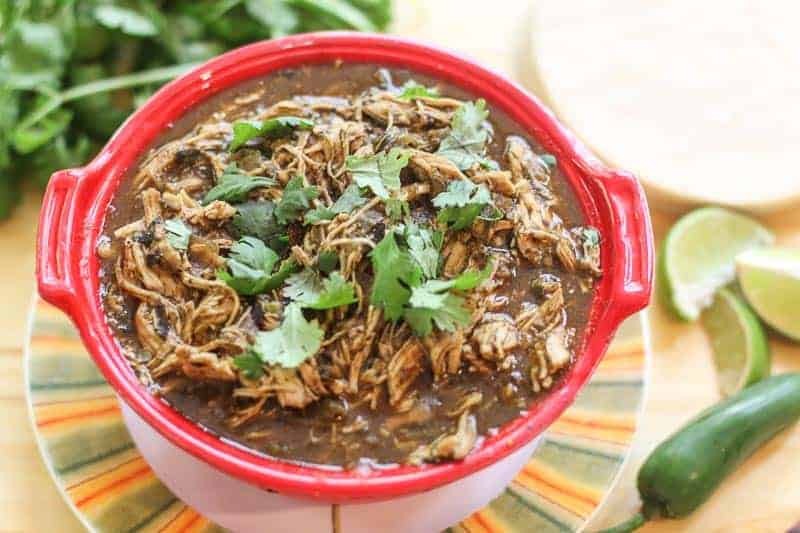 I have been making my Instant Pot Shredded Buffalo Chicken and 15 Minute Instant Pot Orange Chicken and this 15 Minute Instant Pot Salsa Verde Chicken as some of my meal preps. I just put them in individual containers and put a serving of the chicken, rice, and veggies. I label each container with the name and date so I can use up the old ones first. My husband used to go out for lunch every day on his lunch break. Now he eats what I pack in his lunch box. He has lost a good amount of weight and he looks fabulous!! He is very appreciative.
. I have found the containers with 3 separate compartments are too big for storing in the freezer and lunch box. I also am not a fan of their lids. So I don’t suggest them personally. Rubbermaid makes a good set. They can just get a bit more pricey. 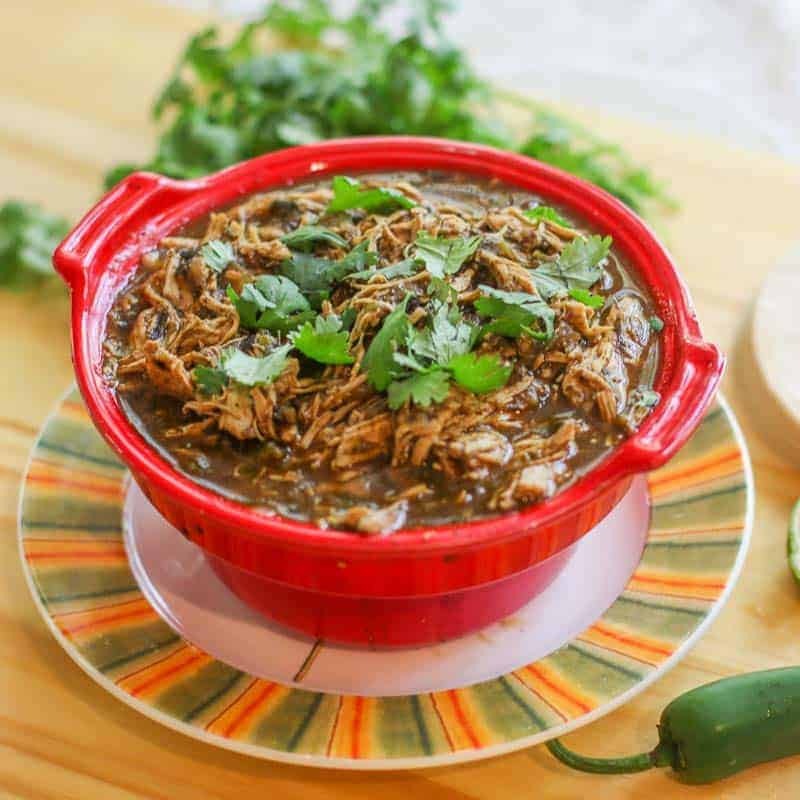 If you like this instant pot salsa verde chicken breast recipe, check out: Crock-Pot Pepperoncini Pot Roast, Jalapeño Cilantro Hummus , and Jalapeño, Cilantro, and Lime Brown Rice. Add half of salsa verde in Instant Pot. Add jalapeño, cilantro, and onion. 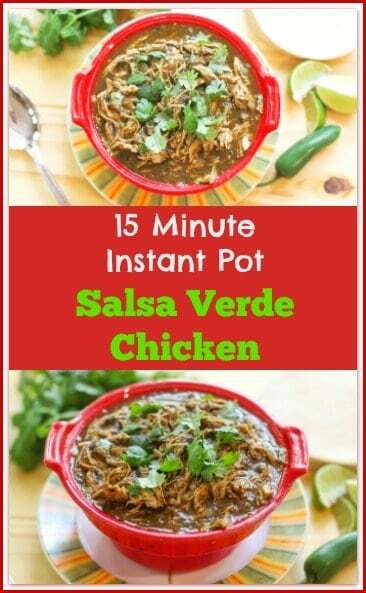 Save 1/4 cup of salsa verde and pour remaining on chicken. Cook chicken on high manual pressure for 10 minutes. Naturally release when done. Shred chicken in Instant Pot to allow the chicken to absorb the liquids. Add remaining salsa verde and juice of lime. Mix well. Most of the sauce should be absorbed back into the meat. If it needs to thicken, use Sauté setting for about 3 minutes. This was the best salsa verde recipe I have found. Thanks for sharing! I just got an Instant Pot for Christmas and this is the first recipe I made in it. It was fantastic!!! I used the Chi Chi’s mild verde and put most of a vidalia onion and 3 cloves of garlic in with it – the onion and garlic disappeared into the sauce and the chicken was so tender and easy to shred. We are having a couple of sour cream/cream cheese based dips tonight for New Year’s so I wanted something tangy to go with them. We will DEFINITELY make this again. Thanks for the recipe! Yikes! That was a typo. Sorry. Thanks for pointing that out. It is 1 1/2tsp of chili powder. Just ran across this recipe. Looks delicious! Can you please clarify how much chili powder is used? Is it 1/12 teaspoon or 1-1/2 teaspoon? I am so glad you liked it!!! That makes my heart smile. By the way I did use Goya salsa verde which I think is the key along with the smoke paprika! Excellent! 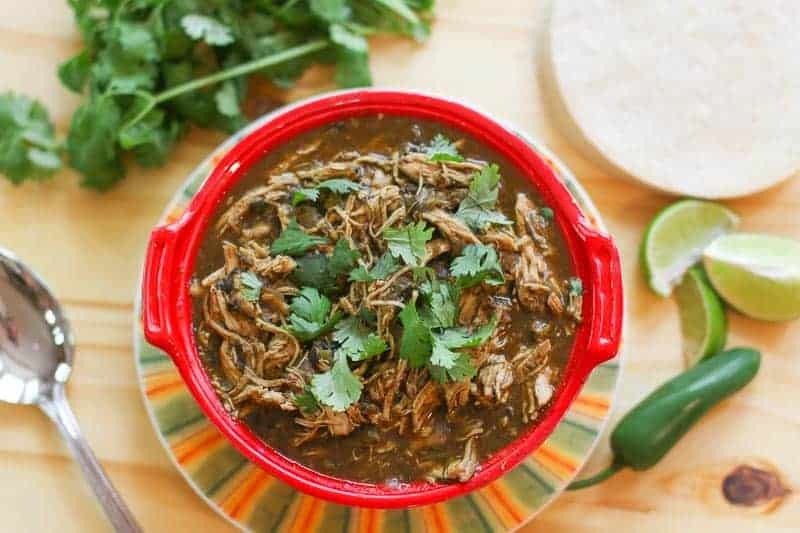 Made this last night with frozen chicken, my 2nd IP meal, and my husband couldn’t stop saying how this was the best chili verde he’s ever had! And he has had a lot of chili verde from everywhere. I did have a problem with my IP coming to pressure so I popped off my gasket and started it again. Over cooked the chicken a bit but it still was so good! Thank you!! One of these days I’m going to get an Instant Pot. Love to be able to make fast and delicious recipes like this! Holy moly! This chicken salsa verde looks so incredibly delicious that I want it for lunch!! Mmmmm.